At The Chiropractic Clinic -Croydon we provide recommendations and advice to help with foot biomechanics. We recommend orthotics including Tri-orthotics that can help correct flat feet, collapsed arches and correct biomechanical dysfunction throughout the lower limb. Orthotics can be used for leisure, work and intense activity. Please read on about the importance of correct foot biomechanics and how orthotics may help. Like a building, the foot supports the rest of our body. When we stand, walk, run and jump it’s our feet that take all of the weight and they do it all of our lives. We all know about the Leaning tower of Piza and how the foundation upon which it was built affected the whole structure, well what happens at our feet also affects other parts of our body too. The ankles, knees, hips and lower back are all integrally related to what happens with our feet. It was only a few years ago that running shoes were developed with advanced pressure absorbing energy, but for centuries before that humans had very basic material covering the feet with no discernible ingenuity to accommodate for collapsed arches or the biomechanics of the human gait cycle. Whether you believe in God or not, humans became more upright and are primates and are designed to walk in a certain way, this is called the human gait cycle. 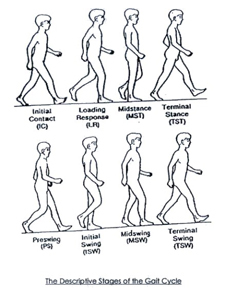 Our walking gait cycle has several stages between one foot touching the ground and the other swinging through and also then touching the ground at which point the whole process is repeated until we stop. Imagine being a cave-man or cave-woman without shoes, trekking around on sand and grass, there was no concrete or tarmac developed by humans back then. Evolutionary changes since those early days in human history have meant we do not use our feet in the same way as originally intended. Try walking on the sand with shoes and again try without shoes, notice the difference? We used our feet to “claw” forward much more than we do in modern times and this “clawing” that automatically helped with foot arch has become redundant like our little toes and appendix. When you hear someone say that you pronate your feet or the foot rolls in they almost mean the same thing. “Pronators” walk on the outside of their feet and as the foot strikes the ground the ankle rolls in and the foot arch collapses. Using running trainers is great for added protection but they lack arch support afforded by professional orthotics. 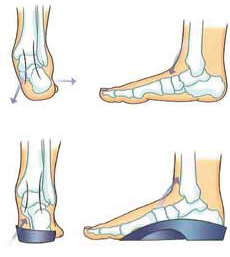 In order to prevent this from occurring the heel should remain vertical, the medical arch must be supported and pressure through the forefoot should be evenly distributed. Podiatrists study the feet and are experts in the field, they know everything about the foot and we can go to a podiatrist for specially built orthotics. Orthotics are expensive however and our decision to invest in an expensive pair of professionally built orthotics made from fibre glass may require some saving. Ready-made removable orthotics with comfortable arch supports are available at many chiropractic and physiotherapy clinics. At The Chiropractic Clinic in Croydon we provide options to people needing arch support with our range of custom orthotics designed to help restore correct foot function and support flat feet and collapsed arches. 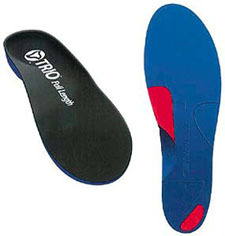 At The Chiropractic Clinic – Croydon our supply of Trio-orthotics provide mid-support to the proximal medial arch of the foot enhancing mid foot stability. The cushioned recess allows the first toe (big toe) joint to extend during toe off which is essential to proper foot biomechanics. 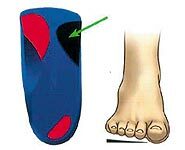 The heel should remain vertical, the medical arch must be supported and pressure through the forefoot should be evenly distributed. Different densities of Orthotic – which one is for you? Medium (Blue) 45 Shore Medium control, good shock absorption, best for first timers and recreational activity. Firm (Red) 60 Shore High control, heavier patients or high levels of activity. Extra Firm (Black) 75 Shore Optimal control, exceptionally hard-wearing, very high impact and activity levels require extra firm density. Please enquire about our range of orthotics and for advice about our range of orthotics and more ways you can prevent problems from occurring in your feet.